If you want to finish your basement in Des Moines, Iowa, turn to the basement finishing experts at U.S. Patio Systems and Home Remodeling. We are highly skilled and knowledgeable, and have helped countless customers transform their underutilized basements into the spaces they have always dreamed of having. • Working – It’s easy to feel overwhelmed when you don’t have any space to spread out and get work done. After we finish your basement and convert it into a home office, you’ll have plenty of space and privacy to complete a variety of tasks and projects. 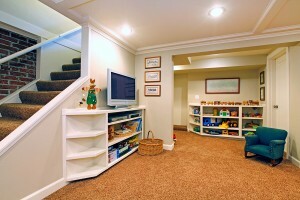 • Entertaining – Turn your underutilized basement into a playroom for the kids or a space for friends and loved ones to spend time together in. • Housing – Increase the number of bedrooms in your house by turning your basement into extra rooms for the older kids or guests to stay in. • Relaxing– Create a library or a second living room in your home that the adults in your house can use as an escape for some quiet time. Whatever type of living space you decide to convert your basement into, our skilled technicians are able to efficiently complete the job for you. Our team can complete a wide variety of installations to finish your basement, including plumbing, drywall, electrical wiring, insulation, HVAC ducts and vents, basement bedrooms, basement bathroom, basement kitchen, and more. For more information on how we can expertly finish your basement in Des Moines, Iowa, contact U.S. Patio Systems and Home Remodeling today.